How low can you go? Golden dice, chained steering wheels, gold rims and tattooed babes are all part of this souped up world of chrome. How can you lose when you’re driving hot pink sedans adorned with purple flames? Join roaring spectators as they cheer the rides on and rate their uplifting performances. Under the pastel lit sky the hydraulics are pumping in these custom classics. Marvel at the candy colored paint jobs and the chromed out carburetors. 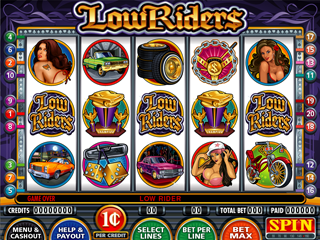 Choose up to 3 hot rides to have the crowd rate their performance where you can win up 1100x your Total Bet. 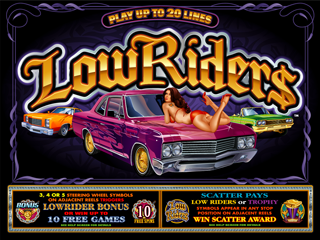 3, 4 or 5 Chain Steering Wheel Symbols trigger the Free Spin Bonus where you can win 3 to 10 Free Spins or entry into the Low Rider Bonus.